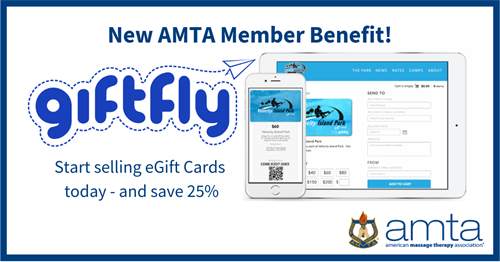 AMTA members can now sell eGift cards online 24/7 through GiftFly. Promote eGift cards for your massage therapy practice on your website, social media or by email. The GiftFly platform and app are free and easy to use. Create your own eGift card designs, and track your transactions and promotions in the app or online. There is no credit card required, and there are no monthly fees. You only pay per eGift card sold. A credit card processing fee of 2.7% + $.30 is processed via Stripe, so you do not need a merchant account. The service charge on transactions can be paid by you as the merchant or passed along to the buyer. AMTA members pay a flat 3.99%, a savings of 25%*. Learn more about joining AMTA. *25% savings on GiftFly service charge is based on an average eGift card purchase of $75. AMTA discount will vary based on the eGift card amount.